Technology is ubiquitous at Learning Paths School. The idea of using technology is just not about learning computer skills; it is about acting on creative ideas to make tangible and useful contribution to the process of learning. The students at Learning Paths School use technology to develop, implement and communicate new ideas effectively. The students use a wide range of technology tools to gain perspectives and knowledge, arouse their curiosity, further their imagination and self-evaluate their learning to set targets for themselves. 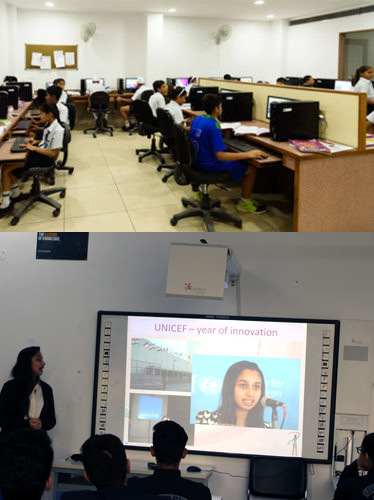 All classrooms at Learning Paths school are digital class rooms that equipped that are rapidly transforming the way, teachers teach and students learn in school. Students learn difficult and abstract curriculum concepts watching highly engaging visuals and animations. This makes learning an enjoyable experience for students while improving their overall academic performance in school. And teachers also gain complete attention and interest of every child in the class. Every child gets a visual input on how it happens and the concepts are well understood. This results in faster and accurate understanding of the concepts in class and helps improve the overall academic performance of students. Teachers are able to keep students engaged in the learning process and also get an instant and accurate assessment of learning outcomes achieved at the end of the class.